The Legend of the Clank! The sound he made was Clank! While making their own Clank! The Dragon of the Clank! Clank! More Clank! More Clank! The treasures of the Clank! AND DON’T MAKE SO MUCH CLANK! Clank! is a deck-building, dungeon-crawling, luck-pushing game for 2-4 players where players delve deep into a dragon’s lair to loot its treasures, attempting to make it back alive before they are lost forever to the depths. If you’re already a Clank! expert, then jump straight over to our review of Clank! Sunken Treasures, and Clank! The Mummy’s Curse. Similarly to deck-building games like Dominion or Trains, players start with a simple deck made up of basic, low-level cards that they’ll use to purchase better cards, then use those better cards to get points. However, Clank! 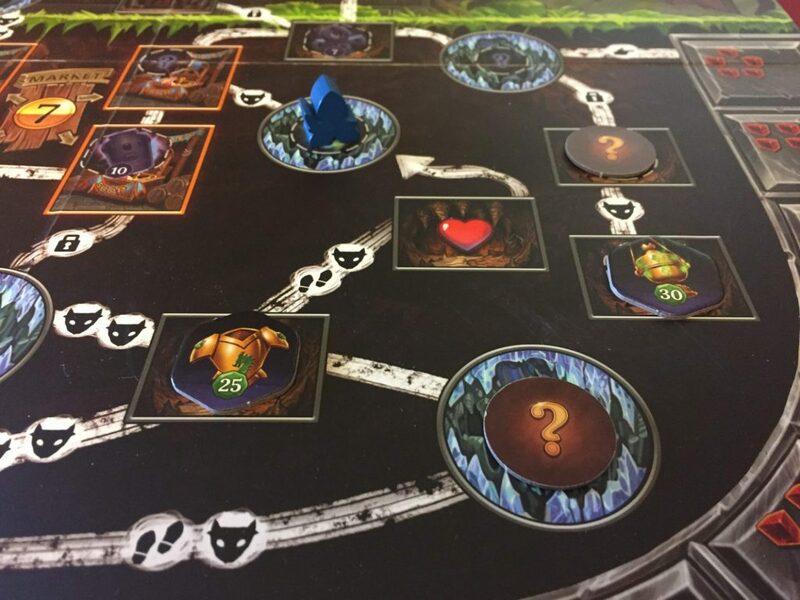 is not just a card game; it cleverly employs the use of a board to depict the players traipsing around the dungeon picking up treasures and valuable artifacts. Certain cards will enable you to move from space to space, while others let you defeat monsters that you find within the depths of the underground lair. What makes this game really shine, however, is the element of push-your-luck that is woven throughout the game mechanics. Most demonstrative of this is the “clank” mechanic. As your dungeon-divers make their way throughout this cave of wonders, they’ll be making noise, or “clank”. This is represented by adding wooden cubes from the noisy player to the “clank” area. Throughout the game, the dragon, who is understandably not cool with the theft of its treasures, will attack. 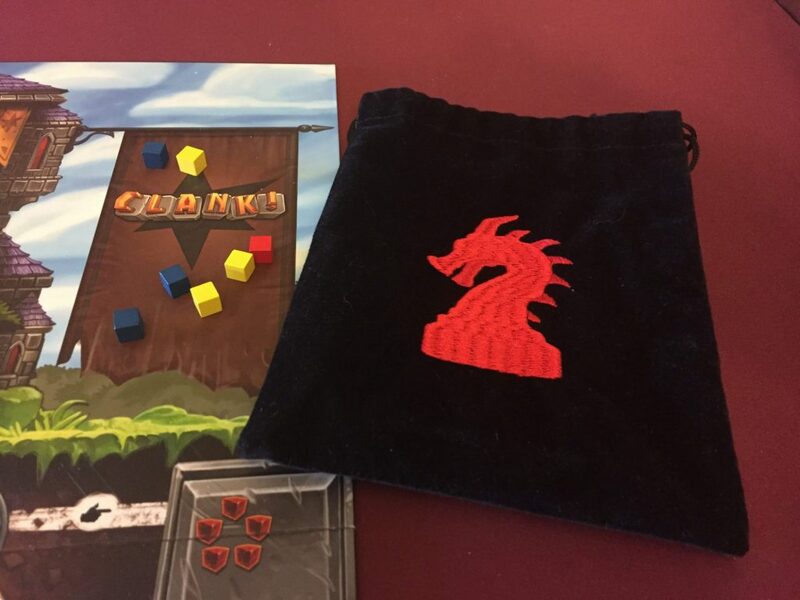 At that point, all of the cubes accumulated in the Clank area are thrown into a bag and a number of cubes are randomly pulled, depending on how angry the dragon happens to be at the moment. At the beginning of the game, 2-3 cubes are pulled depending on player count. However, as the adventurers pick up valuable artifacts and the dragon’s eggs, the dragon gets angrier and more cubes are pulled. When a cube of your color is pulled, it gets added to a damage track. Once the damage track reaches the skull icon, your character dies. Grab at least one artifact before booking it for the exit. Naturally, the most valuable artifacts are deeper down in the depths. Once one player dies or leaves the dungeon, it starts a 4-turn endgame countdown. On eliminated players’ next turns, instead of playing cards they initiate a dragon attack, drawing progressively more cubes as the turns advance. This creates some interesting decisions. Do you go deep into the dungeon to get the higher-point treasures and risk not getting out alive? Do you grab the first one you see and make a beeline for the exit, knowing that the other players may have a chance to get more points as they make their way back? How much clank are you willing to make in order to rush through the dungeon, knowing that with each dragon attack your chances of survival keep dwindling? Clank! has quickly earned a place in my collection as not only one of my favorite deck-builders, but flat out one of my favorite games. 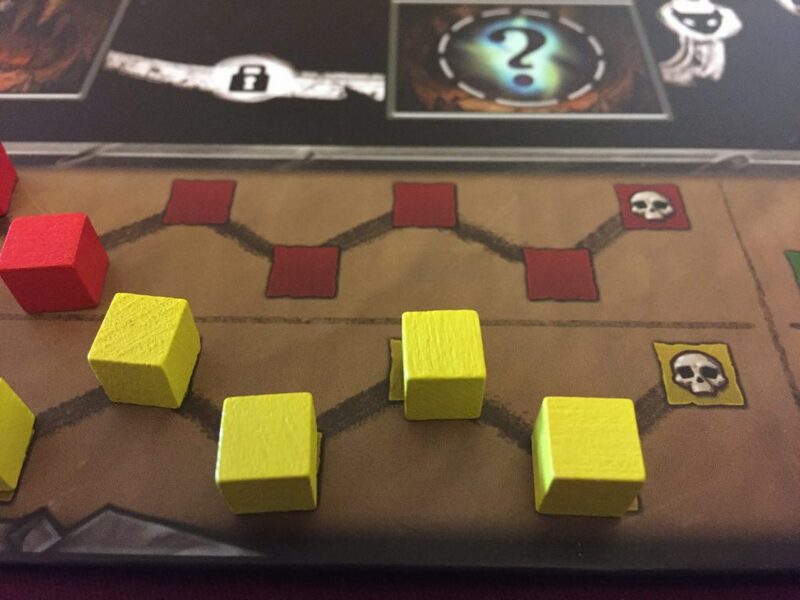 The clank mechanic brilliantly incorporates the element of organized chaos that I like in my games. 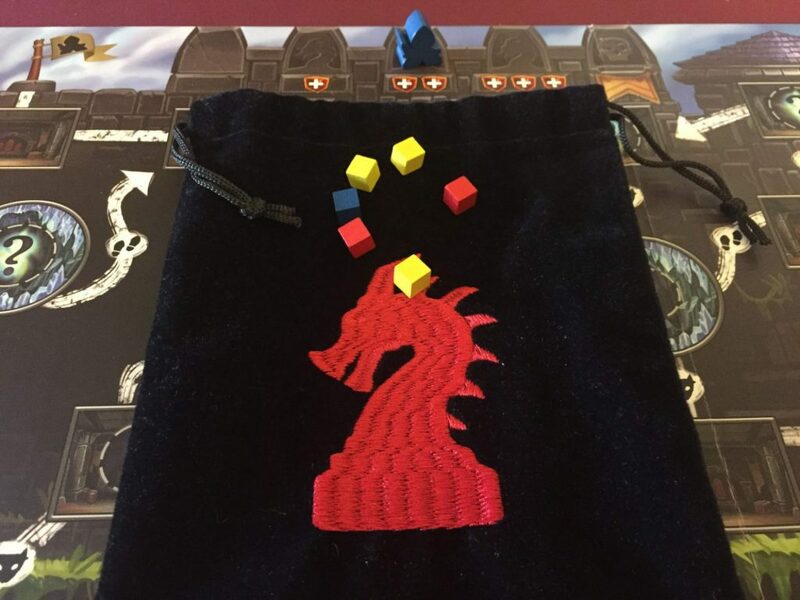 I love pulling the cubes from the bag when the dragon attacks, as well as the general satisfaction of constructing my own unique deck of cards that usually accompanies a deck-building game. I love the interesting decisions in this game. Everything you do has a potential risk to it. 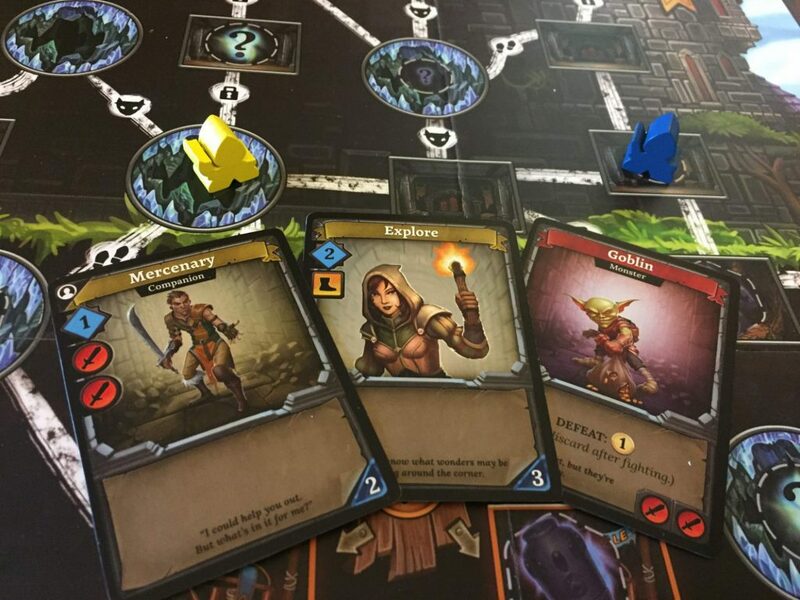 Should you get cards that let you run quickly or give you big-time points, but make more clank? Or should you play it safe and get some cards that give you less clank but don’t help you escape unscathed? Full disclosure: after playing at least a dozen times, I’ve only made it out of the dungeon once. More often than not, I get so greedy that I lose everything. And yet, I love every minute of it, even when I don’t make it out alive and come in literally dead last. If you’re looking for a light-hearted dungeon-crawl with plenty of theme and flavor, Clank! is the treasure that you’ve been searching for.